Mother's Day is quickly approaching and Ninja products are here to help you make moms day as special as possible. 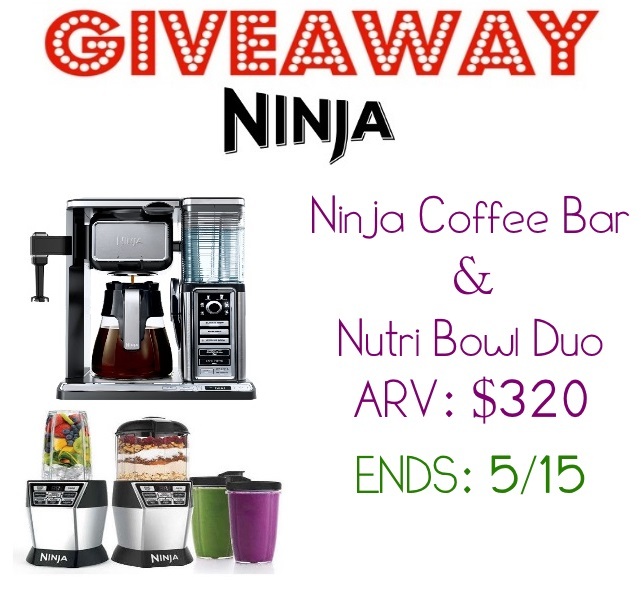 With their 2 newest items, the Ninja Coffee Bar System and the Ninja Nutri Bowl Duo, you can make her morning as amazing as you possibly can! Not only do these make great gifts to give mom to make her days easier, but they are also perfect to buy ahead of time and make her morning special by using these products. First we start with the Coffee Bar System, Perfect for making mom the PERFECT cup of coffee as part of her breakfast. She will really appreciate it, more than you know. The Ninja Coffee Bar System is really amazing and has changed our life so far. This system has 6 different brew size settings on it so you can brew coffee for any need. I use the XL cup size the most or the Travel if I'm making iced coffee. It has a regular, reusable coffee filter so my husband and I can brew our different coffees very easily (I require decaf and he does not). It has an attached frother, which is awesome for getting that foam on the top of the cup. Just place into your cup and push the button on the top. This flips to the back of the unit to save space. It even has an included scoop, which is perfect and it also shows you how much coffee you need for each size you brew. The different size settings, and also brew settings as well. The Coffee Bar System also features a Clean Cycle Indicator, letting you know when to clean your machine out well. Then we move on to the Ninja Nutri Bowl Duo. My favorite blender I've EVER used. This has just 1 1500 watt base, but includes 2, 24oz cups, with lids and a 4 cup Nutri Bowl. I love that I have 1 base for making smoothies, but also for chopping and making other foods. Saves on storage space. It comes with 3 blades, Prep Blade (for chopping), Dough Blade and a Pro Extractor Blade which is for smoothies and breaking up ice. SUPER easy to use. I usually just push the start button until my smoothie is ready, but there is also a pulse button and different buttons what different things, like chopping and simply just mixing. Both items include the Auto-iQ Technology. Which is a 1 touch system and makes these items super easy to use. I can't wait to use the Nutri Bowl more for different things like making my banana bread, and making energy bars, etc. It's the perfect item to have in any kitchen! So grab some before Mother's Day and surprise her with some fresh Banana Bread and a nice, frothed, cup of coffee in the morning! Price: The Coffee Bar is $180 and the Nutri Bowl is $130. Overall: ***** So far, HANDS down! BUT you have the chance to WIN both! I don't have any special plans for Mother's Day. We'll spend a quiet day at home. My son is taking me out to lunch for Mother's Day. Holidays are usually crowded around where I live. We will probably go to church, then come home for a relaxing day. I'm hoping to go somewhere nice to eat either before or after Mother's Day. soccer and baseball games for me! I plan to send it with my sons. Our plans are to go to dinner and have a nice relaxing day with my family.